Bed Bugs have become an increasing problem all over New York City! The only way to eradicate a bed bug infestation is for the tenant, all resident managers and the pest control company to pitch in and work together accomplishing the proper cleaning procedures, structural repairs and pesticide treatments. 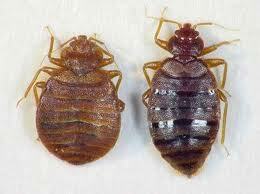 Bed bugs can be found in your personal items! It is absolutely necessary to launder all of your clothing and wash/wipe down your personal belongings. The pest control company cannot treat your personal items with chemical, and if it cannot be treated, it MUST be cleaned! If just one bed bug or bed bug egg is overlooked during the treatment process, the unit will become reinfested in no time, and all sanitation, structural and pest control efforts will have gone to waste. Do you think the tenants below got rid of their infestation without cleaning their personal items? Take a look at the images and decide for yourself! Why should tenants take cleaning their personal items seriously? Pest control companies cannot treat your bed with chemical! Mattress covers anyone? The above picture displays a box spring infested with bed bugs! CLOSE UP! Chemical treatment is not enough. Severely infested box springs and mattresses need to be wrapped and properly disposed of. 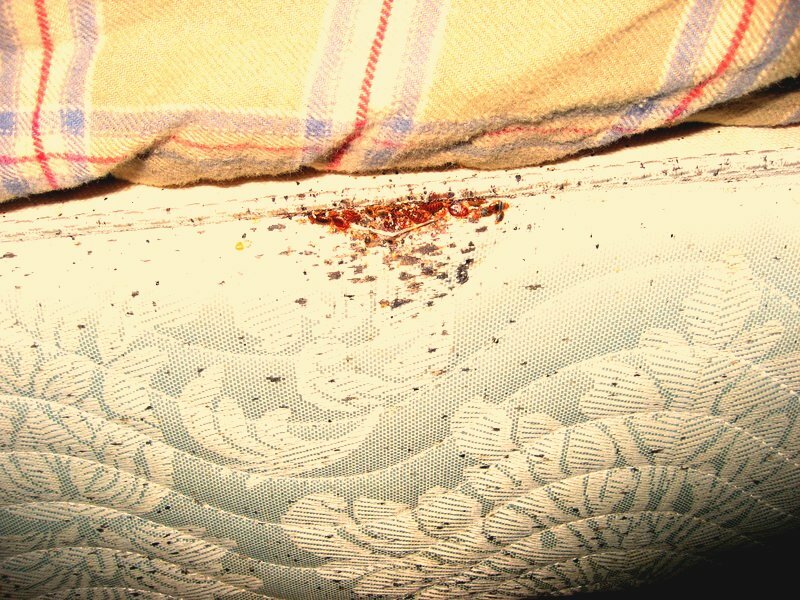 Bed bug covers that are provided by your super or available through protect-a-bed.com will help prevent infestations such as this and are suitable for minor or preventative treatments. Please note then when disposing of mattresses, box springs, or any furniture that once resided in a bed bug infested apartment, all items must be tightly wrapped and sealed and marked BED BUG INFESTED so that they are not picked up off the street to further infest other residences. Why is it important to vacuum and seal all cracks and crevices? The above image shows a seemingly normal door hinge. CLOSE UP! Upon closer investigation, a bed bug was witnessed crawling out of the cracks in the door hinge! All holes, cracks and gaps need to be dusted by a pest control company and then sealed to make sure no bed bugs are coming in from your next door neighbor, or getting out! Any item inside a bed bug infested unit is at risk for contamination, including loose plastic bags and miscellaneous clutter. Cleaning and decluttering is essential to the success of the treatment! CLOSE UP! Once again, upon closer investigation of the plastic bag in the wicker pail, what appeared to be dirt was actually adult bed bugs and nymphs. So... are you cleaning yet? Believe it or not, there are people living like this who still refuse to clean their apartment. Follow the preventative measures we recommend in our article listed to the right, "Preventing Bed Bugs TOP TEN" and you will have a better chance of keeping your apartment free of bed bugs. You never know when someone living in these conditions will sit next to you on the subway or be your next door neighbor! For more information on bed bugs and alternative methods of dealing with them, please click on the websites and articles listed below. Bed Bugs can be a very sensitive topic and emotionally overwhelming. Please see this site for a support group (if needed).